'08 Parting Shots: Seriously, McCain? Sometimes it is explicit, as when a Georgia bar owner visually compared Senator Obama to a playful monkey, or more recently when a San Bernadino Republican group distributed Obama Bucks adorned with visual racist stereotypes linking African Americans with watermelon and fried chicken. At other times it is a bit more subtly coded, as when a nationally syndicated political pundit emphasizes “blood equity” rather than “race or gender” as a sign of one’s fitness to be president, or when the current housing crisis is blamed on the efforts of ACORN, a “community organizing group,” to facilitate mortgages for “low income groups” and “inner city” residents rather than, say, on those within the financial industry who targeted such communities for subprime loans in the first place. At first blush, everything seem reasonable enough. After all, presidential candidates need security, and crowd control is a valid concern for local police departments, even when the purpose of a large event does not engender the high visibility of a hotly contested political campaign. The presence of the police at such an event is a legitimate usage of state authority to maintain public order that should not even raise our eyebrows. But of course there is something disturbing about the scene captured by this photograph and it warrants our careful attention. Dogs were regularly used to hunt down escaped slaves or to otherwise keep unruly slaves “in their place” in the 18th and 19th centuries, and in our own era they have been used by the police to intimidate and control nonviolent black marchers and protesters as during the civil rights movement of the 1950s and 1960s. 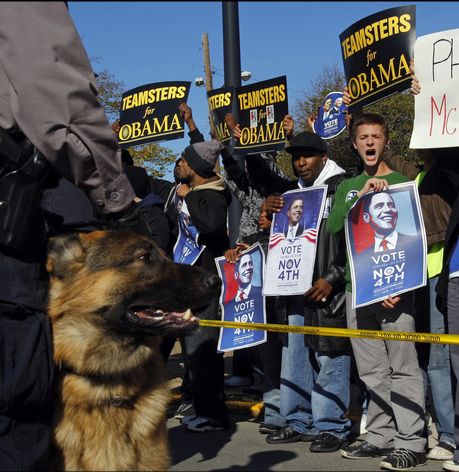 The presence of the dogs at this rally thus function, at least in part, as an altogether insensitive symbolic reference to the “unruly” slave and the “rabble” of black protesters, particularly as the protesters/supporters are divided from the forces of order by a police line that implies that they stand on the other side of the law. But lest I be accused of a too simple “political correctness,” there is more, for the presumed legitimacy of the very presence of guard dogs—and why else would the police use them but for the belief that they were necessary to maintain the peace—contributes to a culture of racial fear and anxiety that manifests itself in comments like those reported recently on NPR by concerned white citizens who worry that if Senator Obama loses the election there will be race riots across the nation.